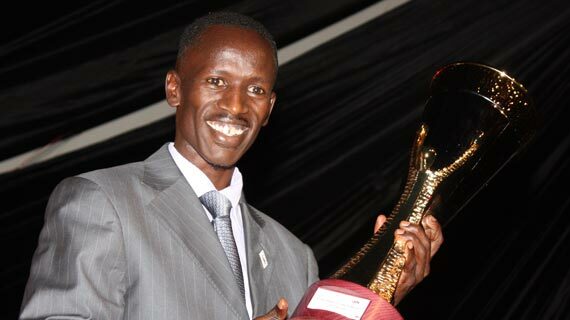 Marathoner Edna Kiplagat and world/Olympic 3000m steeplechase champion Ezekiel Kemboi scooped the 2013 Safaricom Sports woman and Sportsman of the year honors in a colorful SOYA ceremony held at the Nairobi national park on Tuesday evening. Kemboi, who is regarded the best barrier and hurdle athlete of this generation bagged the overall sportsman of the award, taking over from Olympic 800m champion David Rudisha currently recovering from a knee injury. The 31-year-old defeated a strong field for the coveted award, a field that included Harambee Stars captain and Southampton midfielder Victor Wanyama and Kenyan Sevens winger Willy Ambaka who took first and second runners up award respectively. The lively Kemboi alluded how he had waited so long to finally clinch, what he termed as the only award missing from his cabinet. The 34-year-old Kiplagat became the first woman to retain a World Marathon title at the championships in punishing conditions last August. Kenya 7’s TEAM, the semi-finalist at the World cup and fifth in the International Rugby Board series topped the teams roll of honor ahead of Kenya Premier league Champions Gor Mahia and the KCB rugby club, the national sevens circuit winners and impala floodlight champions. National volleyball women head coach David Lung’aho who is also the Kenya Prisons tactician won the coach award with Kenya Pipeline and national team player Roselyne Odhiambo who overcame heart conditions and returned to the court after two surgeries won the comeback award.